1) Belvoir Fruit Farms’ elegant pressés—made with pressed juice, flower essences, and sparkling Belvoir spring water—are harvested from orchards and hedgerows in the Lincolnshire countryside. The thirty-year-old drink maker is famous for its elderflower cordials, but offers a lengthy flavor list of light and simple pressés for international enjoyment. 2) In mint, strawberry, and ginger, Limonitz is a fizzy, more adult take on a summertime classic, less sweet than the lemonade of old, and with more tart bite. The organic, ready-to-drink bottles sparkle alone, and work wonderfully mixed with spirits. 3) Australian-brewed Bundaberg is no slouch. The famous Ginger Beer is brewed with ground, locally grown root that is heated with sugar into a wort, then maturated and diluted to drinking strength. Bundaberg root beer is made from a traditional recipe of sarsaparilla, licorice, molasses, and vanilla bean. 4) Made in small batches with premium matcha powder, apple cider vinegar, and lemon juice, and sweetened naturally with agave and honey, Motto sparkling matcha tea packs the remarkable health benefits of green tea into grassy, tart, soda-like refreshment. 5) With the goal of offering a “session soda,” something less sweet, more crisp, and complex to enjoy while socializing, Höpt Soda infuses extracts from a blend of hop varietals into enticing flavors: salted lychee, pear and basil, elderberry and herb, and watermelon and mint. 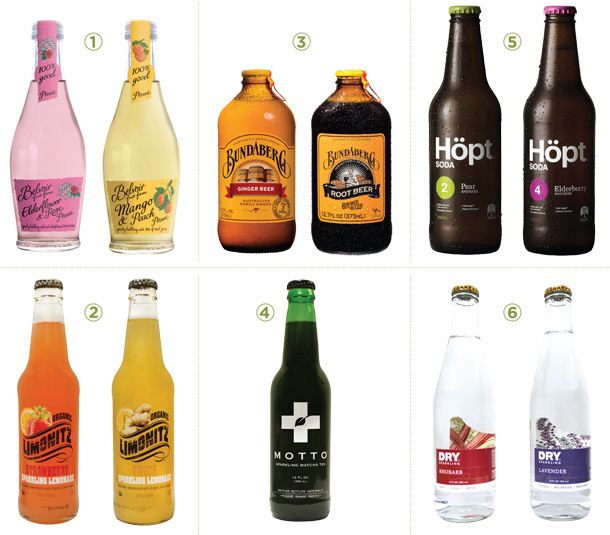 6) Seattle-based Dry Soda is aptly named. Bottled culinary flavors like rhubarb, juniper berry, lavender, and ginger taste more like fancy tonic drinks than pop: dry, light, and not-to-sweet. For food pairing these are ideal, and the flavors make smart cocktail toppers, too. —Find more inspiration on outfitting your shop every month in print.